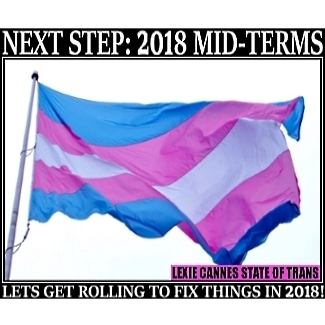 Home › Transgender, Transsexual, Trans › AMERICA, 2018 mid-terms! We get to work NOW! LEXIE CANNES STATE OF TRANS — I stole this headline from Jenn Burleton. It’s really the only thing we can do. We can’t dwell on the what ifs, or whys — it’s wasted energy better spent on fixing our future — the 2018 mid-terms, for instance. We certainly don’t need the stress. The people have spoken and we have to respect it. We’d want the same if our candidate won. Things are never as bad as predicted. On the upside, the president-elect did say, “what have you got to lose?” He has 2 years to show us why he was worthy of our vote. In the meantime, I hope you can join me in actively holding the new president accountable for his promises, preventing a trans rights rollback, and setting the stage for Democratic comeback in 2018 and finally, a new president in 2020.
why bother, this country is too STUPID for its own good, maybe it imploding will show that we were right. if the republichristian party supports him, he has FULL control, other than actual constitutional changes, he could do what ever he wants. and i think he will do quid pro quo with them, sign things THEY want for passage of what HE wants. Teresa, do you really think Turnip can deliver what he promised to his supporters? Be patient, th burden is now on him to do the impossible. I am with you. Any way that I will be able to help, I will be there. I agree with you, Lexie. It is much harder to deliver than it is to speak. We need to restore Democrats to power for the sake of human rights. Count me in! To return to the closet is not an option!